Here's one archive live performance I never thought I'd see. Most of you krautrock fans are quite familiar with Michael Rother's post-Neu! band - Harmonia, where he had joined up with both Roedelius and Moebius of Cluster. I do seem to remember reading, I believe it was an article in Alternative Press or perhaps Spin magazine, back when the long-lost just-discovered ' Tracks & Traces' CD was released, that Harmonia had in fact performed a handful of live gigs and someone in their camp was attempting to locate a live recording of one of those shows. 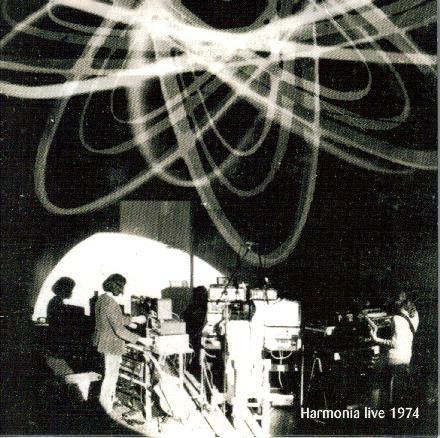 As it turns out, ' Live 1974' is a concert of all previously unreleased Harmonia material. Very nice. This five track improvised (I'm assuming) performance took place on March 23, 1974 at the Penny Station Club (a former railway station) located in Griessem, Germany. I read somewhere that Rother had recalled there must've been about fifty patrons attending this shindig although you don't hear a sound from the stoned crowd. However, rest assure the quality of the music is none other than first rate. Here's the low down track by track, as I was totally impressed with the opener - the raga tripping "Schaumberg", the familiar sounding seventeen-minute "Veteranissimo", the out-standing "Arabesque" (loved the guitar noodling and synthesizer wizardry), the somewhat stagnating fifteen-minute epic "Holta Polta" and was nearly blown away by the memorable cosmic magic of "Ueber Ottenstein". Personnel: Michael Rother - guitar, piano & organ, Hans-Joachim Roedelius - piano & electric organ and Dieter Moebius - synthesizer & electronic percussion. Fans of such krautrock artists like Golem, Ash Ra Tempel, Comic Jokers, Galactic Explorers and early Tangerine Dream will eat this title up. So extremely highly recommend, it makes my head hurt. Plus, I hear that Harmonia has reunited recently and are playing live shows once again. Check out their MySpace page and look for live video snippets on YouTube. Guaranteed to make your day.